There are upwards of 100 licensed beer manufacturers and thousands of home brewers across Ohio. Each of their products proudly bears a local signature, but in most cases you’ll find lots of imported ingredients going into the mix. Estimates from Ohio State University Extension say the Ohio beer industry spends $30 million for hops each year, mainly shipped in from Europe (England, France, Germany) and the Pacific Northwest. Not only is the money going out of state, it also doesn’t make much of a local flavor statement. 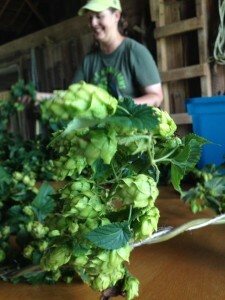 But the Ohio hops industry is developing quickly to offer an alternative to importing. As of 2016, Ohio has more than 100 acres in hops production. Some 6,000 acres would be needed to replace the imports used today by Ohio manufacturers and home brewers. Little Miami Farms is proud to be among the first growers to be a part of the newly established Ohio Hops Growers Guild, working with the increasing number of hops growers around Ohio to establish quality and processing standards to insure consistency of product, grower efficiency, and build awareness and demand for the products of the Ohio hops industry. If you are a brewer, please give Ohio hops a try – especially those sporting the OHGG Seal of Quality. If you drink local beer, please ask your local brewer to use Ohio hops in your favorite brew.